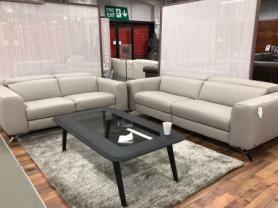 The Amore Fusion is a comfy and stylish suite in an extremly modern grey hard wearing fabric that will compliment and home living decor. This sofa benefits from ddjustable headrests to get you In the perfect position for the ultimate rest and realaxation. Also Available as a 2+1+1 Seater (2 Seater Is Manual Recliner) For £1799. Chairs Can be Bought Seperately For £499. Approximate Measurements: 3 Seater 222 cm. 2 Seater 170 cm. Chair 108 cm. Depth: 92 cm.